Fueled by the success of a prior renovation, our client was ready to update their master bathroom and say goodbye to the last vestiges of the home’s outdated design. A one-way slanted ceiling, 1980s style block glass, dark corners and dated tile made the space feel smaller and more segmented than necessary. Ordinary looking cabinetry and fixtures also needed an upgrade to achieve the sleek, contemporary look our clients envisioned. Our team got to work on transforming the space into an open concept master bathroom filled with luxurious, modern amenities. We replaced the sloped ceiling with a main barrel vault centered over the existing arched window. 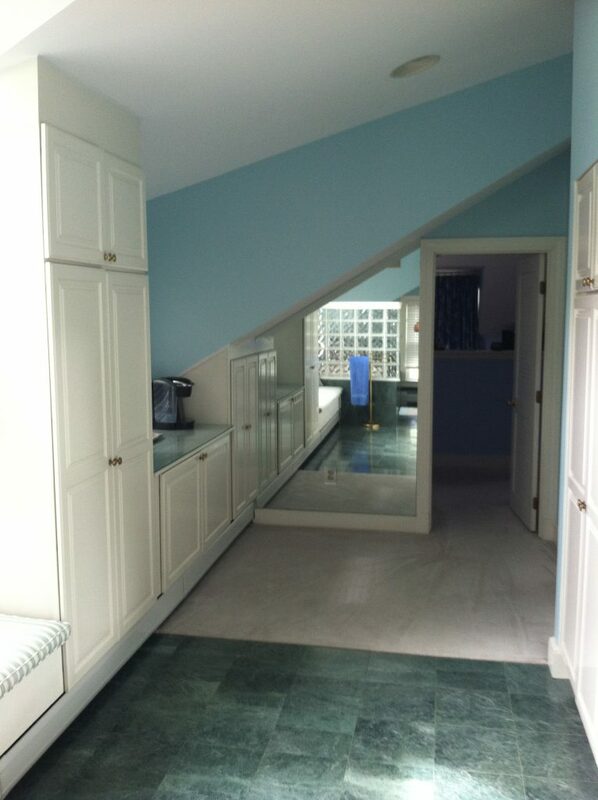 This immediately added height to the room and gave it an overall more airy feel. The floor plan of the room was reorganized, block glass was removed in favor of frameless clear and frosted glass doors, and linear textured porcelain replaced the former green marble floor tile. 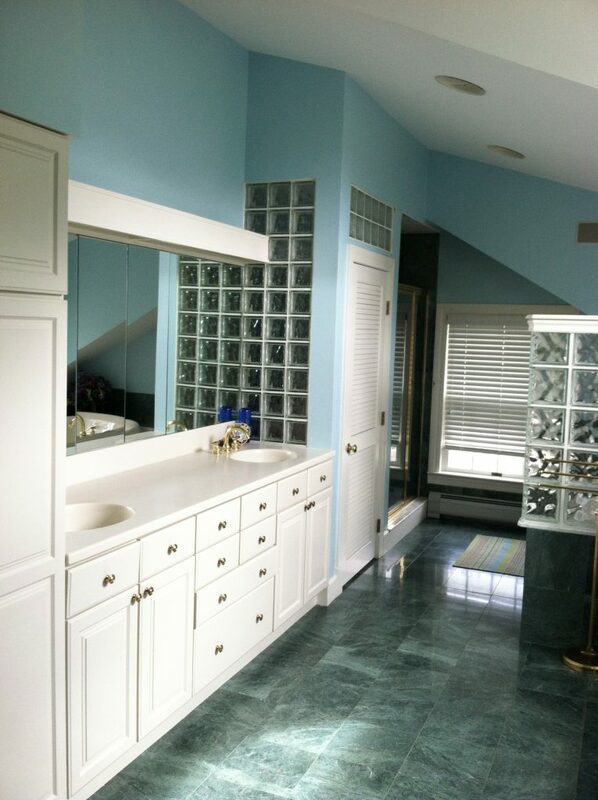 Floating vanities were high up on our clients’ wish list to add space and a contemporary feel to the room. 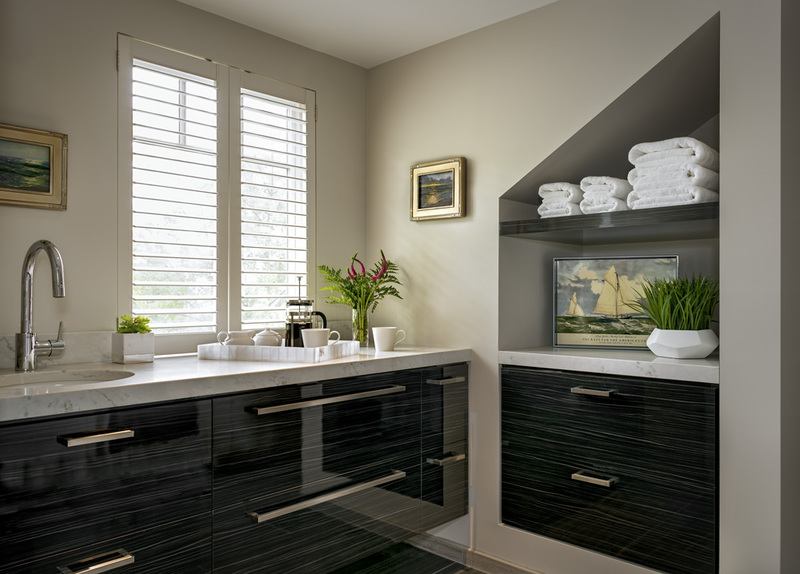 White and grey veined quartz countertops offer a beautiful, dramatic contrast with the glossy black striated laminate on the vanities. To complete the modern look, we installed polished chrome fixtures throughout the space. Updated lighting also made a dramatic difference in this renovation. Modern LED light fixtures set at 3500K mimic natural daylight, enhancing the sun that already flows into the room from the large, arched window. 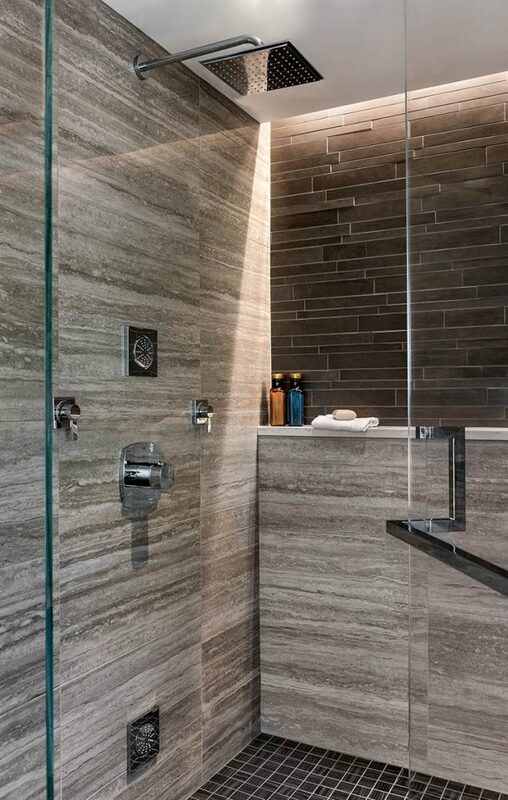 Recessed cove lighting in the shower creates a window-like effect, splashing a ray of natural looking light from above. State of the art amenities were included in this design at every turn. The oversized shower includes a rain head, body spray, and a hand shower for multiple bathing options. A coffee station with a bar sink is tucked into the corner atop custom, floating cabinetry. 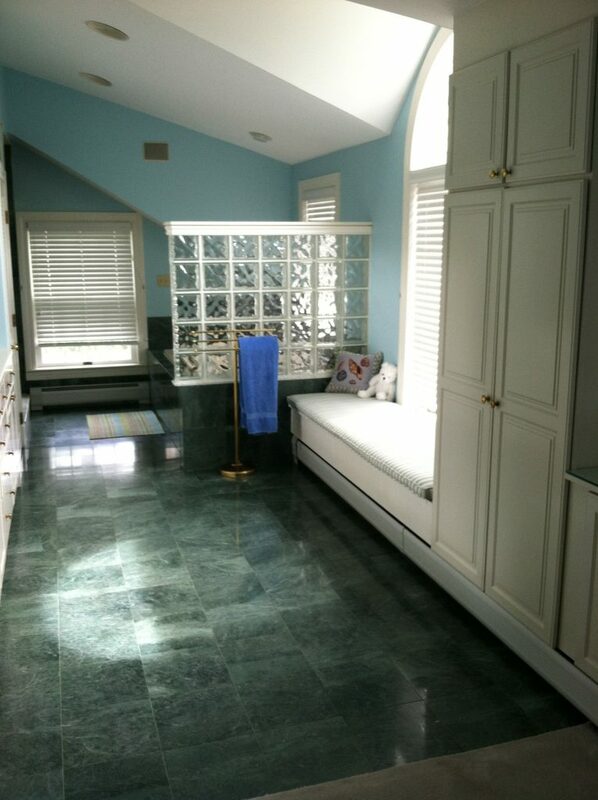 This area offers plenty of space to store towels, linens, and other beach house necessities with ease. Plus, what could be better than having a fresh cup of coffee at hand as you prepare for the day ahead? Last but not least, that bath tub! 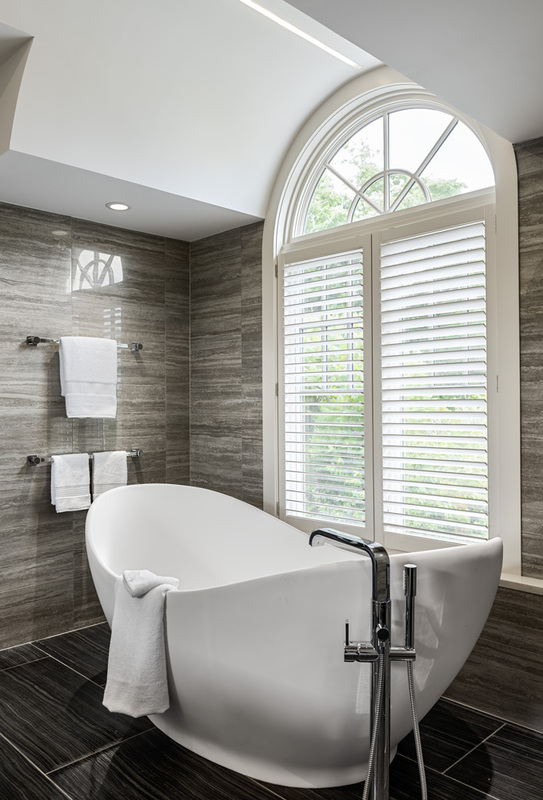 A statement-making, sculptural tub was installed right by the arched window. We can’t imagine a more relaxing place to soak after a long day of summer fun. 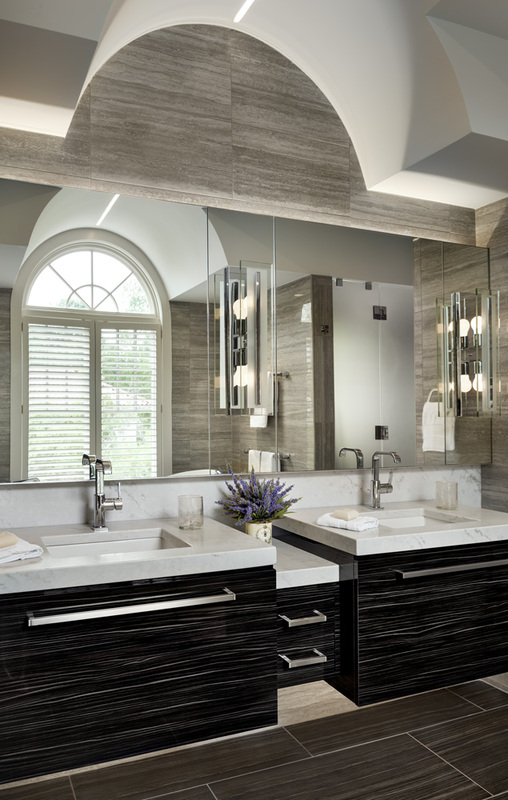 We were thrilled to create this beautiful, open concept master bathroom for our clients. A beach cottage is already the perfect place to unwind, and this luxurious space makes it even easier to relax. 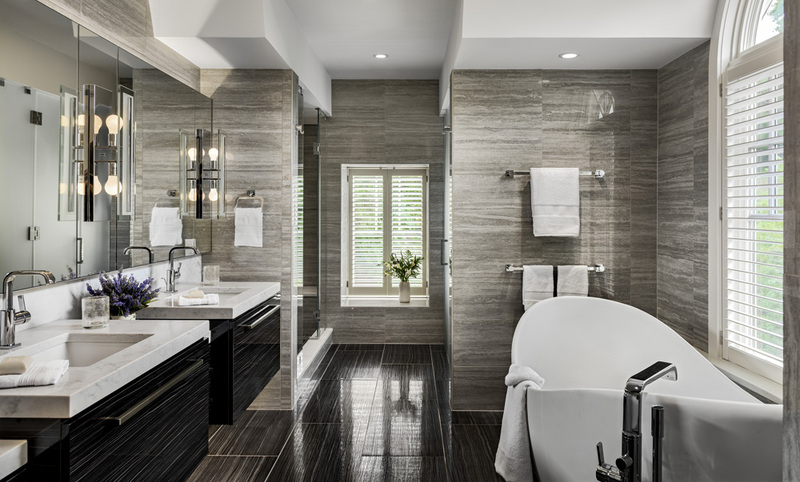 If you’re looking to renovate your master bathroom, re-imagine your interiors, or even build a beach cottage of your own, please reach out to us to get started.